"The varying spam levels across states can be attributed to different socioeconomic factors and levels of security awareness in each state," said Matt Sergeant, Senior Anti-Spam Technologist, MessageLabs. "The states that are experiencing higher spam levels may not place as high a priority on IT security overall or employees and businesses may be more willing to share their personal contact information in public domains. When email addresses are openly available, spammers take advantage of it and inundate those inboxes with massive amounts of spam." MessageLabs scans three billion email connections per day and in June 2008, the global ratio of spam in email traffic from new and previously unknown bad sources was 81.5%. 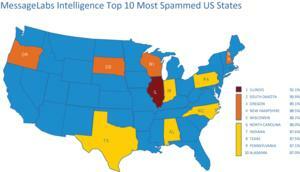 The lowest percentage of spam going to a single state was 78.5 percent. 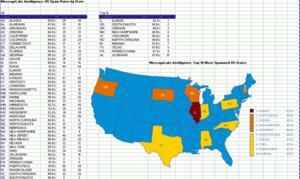 The average spam level for the entire US reached 86 percent in June. "Not only are spam levels increasing, we are also seeing several new and different types of spam," Sergeant said. "Spam has become mailed out in smaller, more targeted batches and spammers are using varying approaches from leveraging celebrity names and current events to grab attention to exploiting mainstream hosted services like Microsoft Skydrive and Google Docs to evade spam filters. Spammers are relentless in their tactics for exploiting computer users." MessageLabs Intelligence is a respected source of data and analysis for messaging security issues, trends and statistics. MessageLabs provides a range of information on global security threats based on live data feeds from our control towers around the world scanning billions of messages each week. For more information, visit http://www.messagelabs.com/intelligence.aspx. These numbers were taken from MessageLabs Intelligence data measuring total number of incoming spam before the deployment of connection management and traffic shaping techniques. MessageLabs is a leading provider of integrated messaging and web security services, with over 18,000 clients ranging from small business to the Fortune 500 located in more than 86 countries. MessageLabs provides a range of managed security services to protect, control, encrypt and archive communications across Email, Web and Instant Messaging. About this company MessageLabs, Inc.